What is IV vitamin treatment? When a client receives IV vitamin treatment, they’re receiving a liquid mixture of vitamins and minerals through a small tube inserted into a vein. This allows the nutrients to be absorbed quickly and directly into the bloodstream, which is a method that produces higher levels of the vitamins and minerals in your body than if you got them from food or supplements. This is because several factors affect our body’s ability to absorb nutrients in the stomach. Factors include age, metabolism, health status, genetics, interactions with other products we consume, and the physical and chemical makeup of the nutritional supplement or food. Higher levels of the vitamins and minerals in your bloodstream lead to greater uptake into cells. Cells then use the nutrients to maintain health and fight illness. The benefits of IV vitamin therapy are many! As discussed above, nutrients traveling through the digestive system can have many interruptions or problems. Because IV vitamin therapy bypasses this system, 100 percent absorption of the vitamins and minerals can be achieved. For this reason, vitamin IV therapy can correct micronutrient deficiencies. This improves the overall nutritional status of an individual, allowing for the relief of many symptoms. What vitamins/minerals can you receive through IV therapy? Commonly seen ingredients in an IV vitamin drip are vitamin C, B vitamins, magnesium, and calcium. IV vitamin drips may also contain amino acids (the building blocks of protein) and antioxidants, such as glutathione. Who can benefit from IV therapy? 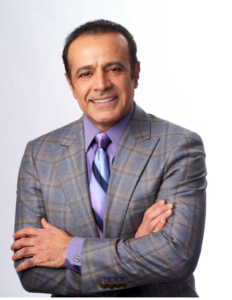 Dr. Kamy co-founded LT Proactive Care Clinic with Life Time CEO, Bahram Akradi in 2013 with the goal of revolutionizing the healthcare model through the four pillars of medicine, nutrition and exercise. Dr. Kamy’s speciality is in age management and bringing out the healthiest and best version of you by utilizing his unique, personalized approach to medicine. His research and years of experience as a physician have led Dr. Kamy to conclude that the human mind has limitless potential and can achieve the impossible, with proper guidance. He is a strong believer that traditional medicine needs to change as new technology becomes available.